Our service men and women, who proudly served our country during the Vietnam-War era, did not know at the time about the devastatingly destructive power of Agent Orange. Many of them were exposed to Agent Orange on a daily basis--either as dispensers of it, or as people staying in areas affected by Agent Orange. Our military leaders quite probably did not know either and were, many of them, also affected by Agent Orange. Therefore, the point is not to assign blame, but rather to deal with the situation as it presents itself to us today. Lives have been deeply affected and sometimes destroyed by Agent Orange. Its pernicious effects endure through generations. Today we need to heal our veterans and their families from this scourge. 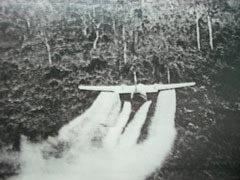 Below are two links to videos on YouTube dealing with Agent Orange. The first video was filmed at Concordia Univeristy in Ann Arbor, MI, where our AVVA members put on a Agent Orange Town Hall meeting. Amy King-Applewhite's testimony is especially moving. The video features members Sandy Wilson and Elizabeth Allen; both served as nurses in Vietnam. <<Link to a youtube video of Amy King-Applewhite's Story - Her father Keith King is a Vietnam Veteran. <<Faces of Agent Orange youtube video. There are many more youtube links on that page.